In June 2013, after nine months of ethnographic fieldwork researching Iranian popular photographic practices in Iran, the UK and online, my principal participants (Iranian photobloggers, based inside and outside of Iran) and I discussed the idea of co-curating a digital photography exhibition of their work. The idea of developing an innovative, site-specific methodology emerged during the research process, but seemed appropriate given that a) it reflected what photobloggers do – they create digital exhibition spaces in the form of photoblogs to share their photographs with viewers across the world – and b) it would establish a relevant digital environment in which to participate and observe their practices. Here I discuss the resulting digital photography exhibition employed as a methodological component during the research process: www.photoblogsiran.com (figure 1). I reflect upon both the rationale behind its development, including the extent to which it was co-curated in a collaborative and participatory manner. The reasons for creating a digital exhibition arose primarily from the nature of the research and requirements of my field site. 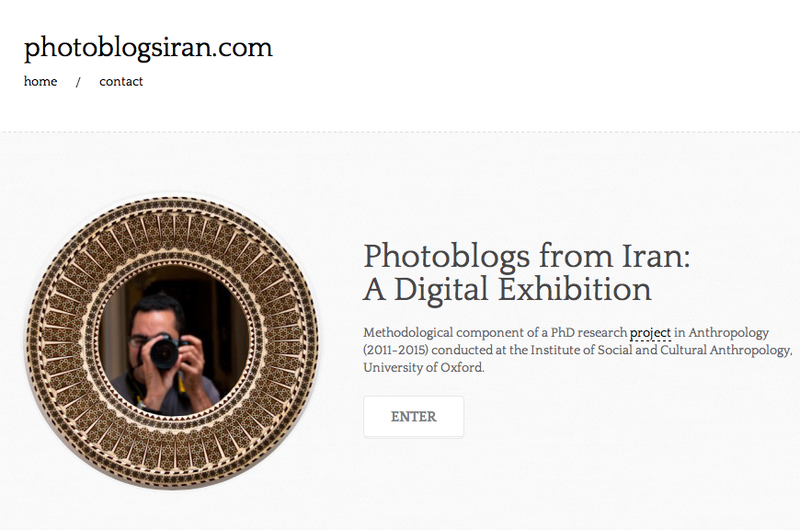 My research explores the social and historical significance of Iranian popular digital photographic practices, with a specific focus on photoblogs (photography-orientated blogs). 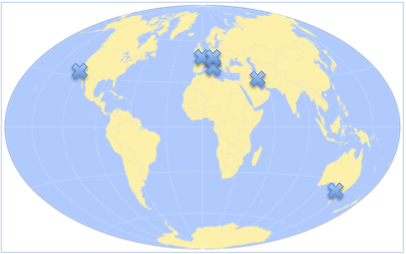 Principal research participants are located in six countries across the globe (see figure 2). Given the multi-sited nature of my field site, the exhibition aimed to facilitate the coming together of geographically dispersed research participants in a delimited exhibition space within the broader digital landscape, and one whose form is also relevant to the subject matter. Through the exhibition, participants were introduced to each other, their work and networks and could acquire a sense of collective identity, as active and creatively involved participants in the project, and not just isolated individuals with whom I conducted research. The digital exhibition discussed here can in some sense be termed a collaborative digital and visual participatory method. It demonstrates, in principle, what Huvila (2008) normatively calls for (in the context of the participatory archive), as requiring necessarily ‘de-centralised curation.’ The exhibition was digitally co-curated with participant exhibitors under a shared ethos of showing examples of contemporary popular photography from Iran using material drawn from their own digital repositories (photoblogs). At the same time, as anthropologists working with museums and archives have discussed, it is important not to over-esteem the emancipatory potentials of collaborative or participatory methods which aspire to reverse or even eliminate power inequalities. Although broadly defined as collaborative and participatory, the nature and levels of participation involved in designing the exhibition were not equal amongst all participants, or between them and myself. My role as facilitator of the project (though fluid and not arbitrary) was ultimately maintained, whilst participants’ levels of involvement varied according to their availability and/or willingness to undertake certain aspects of the process. Commitment to egalitarian ideals of collaboration should clearly never supersede the sensitive realities of working with participants, wherever and however the ‘ethnographic encounter’ takes place. The researcher’s ethical commitment should rather attend to circumstances emanating from the field and from individuals’ personal lives. In the case of this exhibition, the concept of collaboration ultimately provided a broadly understood ethos rather than a dogmatic schema, within which levels of participation were negotiated on an individual and nuanced basis. Once established, the exhibition engendered the use of related visual anthropological methodological activities such as digital photo-elicitation. 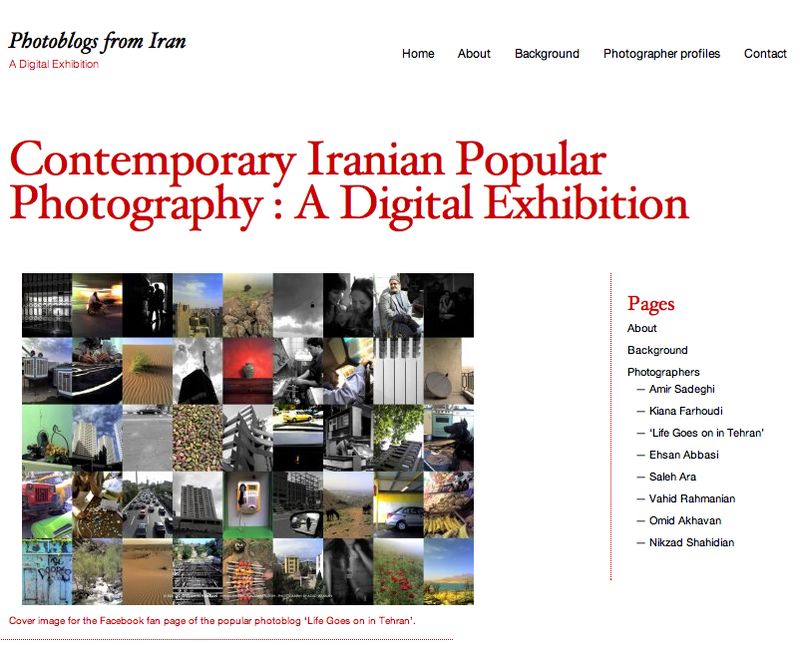 The URL was shared with photographers not taking part in the exhibition, Iranians in Iran and in the UK, as well as gallery curators, artists and journalists in Tehran and London who were contributing to the wider ethnography. Viewed in digital form and not in fixed, physical locations, the digital exhibition hereby re-conceptualises the notion of the ‘travelling exhibition’ (Kratz 2002), though I found it to be just as lucrative a research method for exploring questions of contemporary Iranian subjectivity and experience. Resonating with Kratz’s findings, the exhibition’s digital movement during the research period similarly exposed ways in which identity politics and cultural stereotypes were reformulated and imagined in different locations. Digital participation in the geographical place and cultural spaces (objects, artefacts and material cultures) of Iran that the exhibited digital photographs evoke was effectively facilitated through the subjective viewing of the exhibition in a variety of contexts across the globe. Another practical reason for setting up the exhibition pertains to the life span of photoblogs. Like most user-generated platforms, their continuation is largely contingent upon their creators’ attitudes towards them. In some cases, the individual may abandon their photoblog for financial, personal or other reasons (figure 3). In these cases, the digital exhibition extends the presence of the ‘dead’ photoblog, (figure 4), propelling it into other digital viewing publics wherein its agency and efficacy are revived and reformulated. Through this process of archiving and preserving, the exhibition also captures the present digital-visual ‘moment’ to which these photoblogs about Iran belong, constructed at specific time and places by particular individuals using certain technologies. The exhibiting photographers constituted some of the main participants in the research process throughout the duration of my fieldwork (2012-2013), based on their levels of interest and commitment to the project. 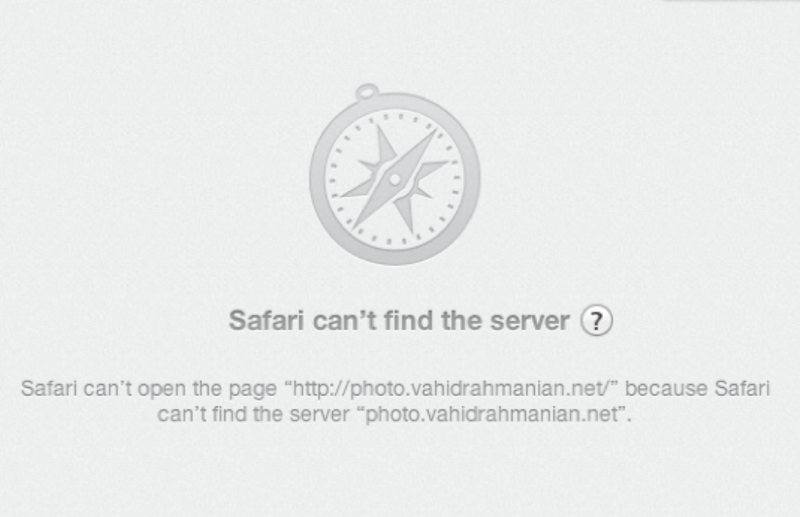 Apart from ‘Life Goes On In Tehran,’ who maintains online anonymity, each photographer is introduced with their real name listed on the right hand side of the home page (figure 5). This reflects a conscious ethical policy whereby, in agreement with participants, I respect their desires to be publically accredited in order to acquire recognition of their work. We collectively discussed my role as researcher and overall facilitator of the exhibition. I was chiefly responsible for assembling participants, overseeing the synthesis of photographers’ self-selected material and introducing the exhibition. I created the ‘About’, ‘Background’ and ‘Contact’ tabs accordingly. 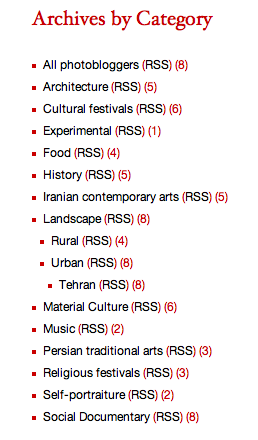 These provide relevant contextual information learned from my wider, critical investigation of the practice (including its emergence in the early 2000s in Iran and how it differs from the wider blogosphere), as well as links to my University profile page and contact details. The descriptions and analysis were approved and also edited by participants. Unlike other established visual methods, photographs shown in this exhibition were not generated by myself as visual anthropologist (Photoethnography) nor by participants for the research process (Photovoice). Rather, they pre-existed in primary locations (participants’ own photoblogs) and related digital contexts such as Flickr, Instagram and Facebook before becoming part of the exhibition’s rubric. A main step we took in co-curating the exhibition therefore was to discuss which and how many photographs (out of the potentially thousands from their own photoblogs) would be included. Without imposing any typological restrictions on photographers’ choices, it was agreed that they would select as many (or as little) as they wanted for their individual exhibit pages. Many participants (included and not included in the exhibition) regarded this aspect – the ability to show many photos – to be one the unique advantages of the digital exhibition space as a vehicle for socio-cultural communication. It’s technical capacity to store and show a substantial number of photographs about Iran was seen as complimentary to the photographers’ wider aspirations to broaden the epistemic and aesthetic scope of viewing Iran. At the same time, freedom to choose also explains the variation in size in each of the exhibits as well as the various categories of image ‘types’ that emerged. The submitted/retrieved photographs total 173. In some cases, photographers felt uncomfortable choosing their own photographs. They would ask me to make the selection, explaining how they did not know what or how many photos would be appropriate, despite my explaining that their subjective choices and any aspects of their work would be suitable. These cases demonstrate the essentially porous nature of the collaboration, which, as previously mentioned, was never absolute or complete, but always adapting to and developing with varying conditions and attitudes. Once the photographs had been submitted and uploaded to the exhibition site (still in draft form and password-protected), we discussed ordering and arrangement. One participant suggested that the ‘tagging’ function might be used (just as with photoblogs at large) to associate categorical image types with a specific photographer’s work. This was agreed to be an effective means of establishing a sense of narrative structure in an otherwise non-linear hypermedia environment. It also reflects what most photobloggers do with their photographs on photoblogs, often grouping them in either categorical or chronological archives. Out of the broader conversations held with participants, thirteen main categories (and three subcategories) emerged from the various themes that photobloggers felt characterised their visual interests (figure 6). The number in brackets shown relates to the photographers (out of the total of 8) whose images can be classified under the said category or sub-category. Collaborative digital participatory projects vary in their goals, approaches and outcomes. Broadly speaking, they share desires to seek active engagements with participants in the presenting, interpreting and circulating of their own material online. Gubrium and Harper (2013:173) define the participatory digital exhibition as a space in which ‘a group of participants work together to create a web-based interface where users may access a multimedia collection of visual, audio and text files.’ The digital research exhibition presented here was largely designed on this basis, though in our experience, it was the fluidity and not the precise consistency of working together which made it an effective method of co-curation, without comprising on ethics. In addition and beyond theoretical definitions, participatory exhibitions also vary according to the specificities of the research, researcher, participants and social, cultural and aesthetic frameworks from which the material is drawn. Iranian photographers felt a vested interest in the digital exhibition as directly linked to their wider, offline practices (and social realities) of taking photographs in and across Iran. Participants’ own photoblogs show pictures they have taken (on mobile phones and digital cameras) of everyday life inside the Islamic Republic of Iran. They present these images (and the diversity of what they show) as ‘ordinary’ (as opposed to the ‘extraordinary’ nature of newsworthy image types). 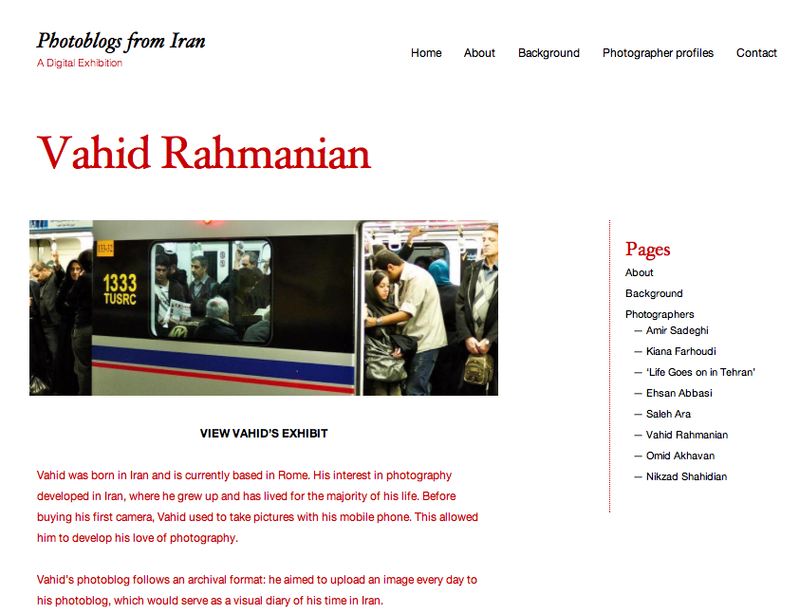 Photoblogs thus provide alternative sources of visual/contextual information to mainstream media representations, inside, and outside of the country, which since the 1979 revolution, they (and many Iranians) feel have and continue to stake heavily ideological and political claims on Iranian identity and what the country ostensibly ‘is.’ Photoblogs also serve as alternative low-cost/free exhibition venues for showing Iranian photography beyond official galleries and public museums inside and outside of Iran and their respective politics, policies and restrictions. Overall, given the wider indexical conditions in which the making, viewing and distributing of images from Iran are more broadly enmeshed, sharing this ethos – of telling these Iranian photographers’ visual stories – ultimately formed the basis upon which the exhibition was collectively envisioned (if not pristinely carried out) as collaborative. It also continues to mark an on-going point of collaborative contact, or ‘contact zone’ (Clifford 1997) between myself and Iranian popular photographers – themselves avid photoethnographers or ‘amateur anthropologists’ (Strassler 2010), intent on playing an active role in exploring the cultural representation of Iran, Iranian cultures and subjectivities. In summary, the digital exhibition created as a methodological component within the scope of my PhD project was a useful and befitting tool through which the research themes emerged, developed and were communicated to relevant viewing publics. It provided a useful basis for using (and adapting) related methods such as digital photo-elicitation, which also acknowledges photobloggers’ own practices of using digital platforms to exhibit and communicate visual information (and elicit responses) about Iran. Both reflecting and normatively contributing to the field site, it advances ways anthropologists might carry out ‘visual interventions’ (Pink 2009) with participants in a range of formal and popular digital exhibitory and archival contexts, raising relevant ethical questions as well as methodological avenues for further exploration. Clifford, J. (1997). Museums as Contact Zones. In Clifford, J (ed. ), Routes: Travel and Translation in the Late Twentieth Century,188-219. Cambridge: Harvard Universisty Press. Gubrium, A and Harper, K (2013). Participatory Visual and Digital Methods. Walnut Creek, CA: Left Coast Press. Huvila, I (2008). Participatory Archive: Towards Decentralised Curation, Radical User Orientation and Broader Contextualisation of Records Management. Archival Science, 8(1): 15-36. Kratz, C (2002). The Ones that are Wanted: Communication and the Politics of Representation in a Photographic Exhibition. Berkeley, LA, London: University of California Press. Pink, S (2009). Visual Interventions: Applied Visual Anthropology. Oxford: Bergahan Books. Strassler, K (2010). Refracted Visions: Popular Photography and National Modernity in Java. Durham and London: Duke University Press. In describing the collaborative curation of her digital photography exhibition, Shireen Walton introduces the fascinating prospect of re-thinking, not only the multiple, shifting identities of ‘curators’ and the ethical addresses of the process of curation itself, but the very idea of a museum ‘public’. Of course, one could argue (quite rightly, I think) that online spaces of representation are but one more dimension of our social life, that the ‘new’ associations and collaborations they seem to facilitate are representative of any social encounter. What I have in mind here, however, is a more prosaic consideration of ‘audience’ – not so much its social configurations, as its corporeal manifestations. I want to ask, how inclusive, materially, is the digital? And, more precisely: what does a digital ‘invisibility’ look like? Furthering Shireen’s above discussion of the lifespan of the digital, could we envisage the possibility of a digital afterlife? These are questions I am currently exploring in my own research on the transnational circulation of celebration photography (funeral and wedding) in Ghana. Funeral and wedding photographs in Ghana can be seen as comprising an imagery of absence: both their subjects and their viewers are, temporarily or permanently, spatially or ontologically, recently or long departed. In Ghana, it is not necessary for couples to attend their own weddings; instead, ‘weddings in absentia’ are held, in which a ‘representative’ couple performs the ceremony on their behalf. The photographs and videos of the event are made with the absent couple in mind, and circulated to them subsequently. Similarly, funeral photographs are made for the deceased him/herself to see. The ‘scenes’ performed in front of the camera in the room where the deceased is lying-in-state testifies to this possibility: women start wailing loudly, ‘putting on a show’, until the photograph is taken. The people for whom it is necessary to visually acknowledge the grandeur of the funeral, are not only the living, who thereby reckon the status of the lineage, but most importantly the dead – who thereby assure the status of the deceased in his/her ‘afterlife’. Photography thus acts as the eyes of the deceased, capturing with the eyes of the dead. The dead and the distant both constitute, in some way, absent subjects and abroad viewers. The making of such photographs, whether to be circulated between countries or beyond ‘the world’, is premised upon an anticipated audience (its needs, desires, expectations) – they are made “with the absent in mind”. Photography as vision of the blind, the dead, or the absent thus asks us to reconsider exactly what ‘audience’ we allow digital photography to make space for. Can the digital, in bridging distances, also forge moments of ontological penetration, of material uncertainty? Can the digital support the interventions of an ‘afterlife’? And how would one go about researching them ethnographically? The specifically digital nature of collaboration and co-curation emerging from Shireen Walton’s research would lend itself exceptionally well to an inquiry into scientific images. James Elkins’ exhibition ‘Visual Practices Across the University’, later turned into a book of the same name, grew out of a similar participatory process, bringing together the visual work of a number of researchers across the university (Elkins, 2007). The collaborative aspect was thus amplified through its manifestation as interdisciplinarity. The exhibition was an innovative attempt to transcend visual and disciplinary boundaries, whereby visuality across the university is broadly divided between disciplines that study images (social sciences, humanities), and those that produce images (natural sciences). Each separate discipline is differentiated by and laden with assumptions regarding what counts as an image worthy of inquiry, and what parts of the world are amenable to visualization. The images in question occupy very different epistemic positions, and these two “image-worlds” (Benjamin, 2005:512) rarely meet. Indeed, as Elkins notes, fields that theorize visuality have traditionally focused on a “very tiny minority of images that figure as art” (Elkins, 2007: iv), leaving the images of their scientific colleagues a few steps away largely unstudied. In line with a more democratic and inclusive conceptualization of the visual and the analytic unit of the image, developed in visual culture studies and more recently in the new field or project of Image Studies (Manghani et al. 2006), the exhibition brought together images from all faculties at the University College Cork, covering image practices from thirty disciplines, ranging from astrophysics and art history to linguistics and food science. Each display included a large image characteristic of that field accompanied by a 1000 word long wall text, a format conserved in the resulting book. This was an important project, committed to explaining the image’s scientific content and context without oversimplifying these or explaining the science away through the usual tropes of ‘beauty’ and ‘pattern’. Through the prioritisation of scientific content at the expense of scientific form however, the actual life of scientific images and the visual practices of scientists are here occluded, and misrepresented through the presentation of single, static images. As Latour notes, we have “nothing to see when we do a freeze frame of scientific practice and focus on the visual itself instead of the movement, the passage, the transition from one form of image to another” (Latour, 1998:421, original emphasis). Indeed, the natural sciences are characterised by a proliferation of images of all kinds (graphs, maps, notations, pictures, diagrams, photos), which are often different versions of each other and the same referent, organised along a visual chain of representation and reference (Elkins, 2007. This movement of the visual is built out of innumerable displacements, translations, transformations and abstractions which stand between the world and things (Latour, 1999), making the former available to human vision and analysis. This movement is also a back and forth between data and image (Galison, 2002), whereby the data can be ‘performed’ visually in multiple ways. This mutability and mobility of images, and their increasingly dense propositional content – the “fusion of pictures and numbers” (ibid: 321) eloquently discussed by Peter Galison – is specifically enabled by digitality. In line with this, the exhibition of a single, static image is deceptive and reductive. In order to take scientific images seriously and study their technical content as closely as art history and other images are – through a ‘symmetrical’ visual anthropology/culture studies as it were – it is important to avoid the artificial extraction of scientific visuality from the digital. Transposing such an exhibition or inquiry into scientific images into the digital realm could be a valuable visual research method and interdisciplinary tool in this endeavour, by foregrounding, or rendering visible, this movement of the visual, for example through the juxtaposition of different image incarnations, an interactive explanation of the propositional content of images, the representation and demonstration of the mutability of images, and cross-disciplinary image comparisons. As Shireen Walton notes, a digital platform or exhibition creates a cohesive, unifying space, gathering together participants and their work, especially useful for multi-sited informants. In the case of a single university, or even broader academic networks, it is not a geographical but epistemic dispersion which is at issue. Indeed, the disjuncture between the image-spheres of the social sciences and natural science epitomises wider anxieties surrounding the fragmentation of the university, and the now old but ever relevant divide between the ‘two cultures’ (Snow, 1963) of the arts and sciences. Elkins’ suggestion that the visual can and should serve as a common language in the university, opening up a space for dialogue between departments (see for example the second seminar in the Wonderments of Cosmos series at UCL, on visualising black holes), can thus be furthered by the use of digital platforms for such collaborative projects. As a visual participatory method, it is conductive to the kind of collective identity it fostered amongst the photo-bloggers in Walton’s project. Ironically, it is perhaps in virtual space that the space of the university can achieve its ideal of unity and cohesion. Similarly to Shireen Walton’s project, my masters research too considered images produced by others. These others were astrophysicists, and thus constituted Anthropology’s epistemic ‘Other’, the hard sciences. As I started researching astronomical visual practices and appropriate field sites, I realised that my pre-fieldwork imaginings of studying ‘pretty pictures’ of the cosmos and shadowing astronomers working in observatories reflected a lay person’s outdated and somewhat romanticized understanding of astronomy and astrophysics. The way most of us see and know the cosmos, as tie-die technicolour glittering forms circulated in magazines and illustrating popular science articles (fig. 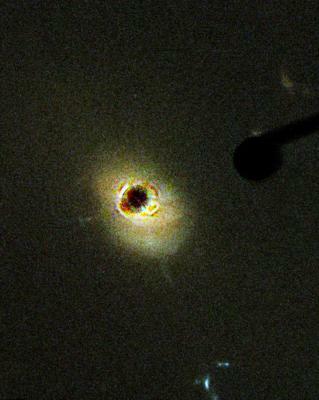 1), are known (sometimes pejoratively) as ‘pretty pictures’ in astronomy (Lynch and Edgerton, 1988; Kessler, 2007). They are a sideshow to the real science and often contain very little information, used instead for public outreach and engagement purposes. 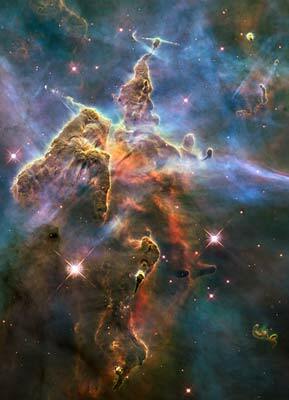 Figure 1: (left) Visible View of Pillar and Jets (NASA, ESA, STScI, 2010), a pretty picture produced for Hubble Telescope’s twentieth anniversary. 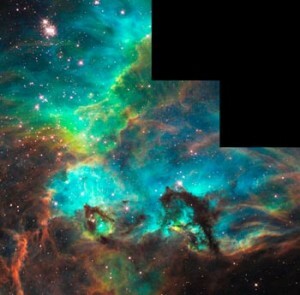 (right) Star Cluster NGC 2074 in the Large Magellanic Cloud (NASA, ESA, Livio, 2008), taken to celebrate Hubble’s 100,000th orbit. Indeed, the images found during my time at Imperial College came as a shock, refusing to yield the “polymorphous magical substance” (Taussig, 2009: 11) that their pretty counterparts enchant the viewer with. Their blurry, fuzzy, pixelized, cloaked surfaces and often not straightforwardly pictorial forms (see for example fig. 2 and fig. 3 as illustrations) demanded a “meditation on blindness, the invisible, the unseen, the unseeable, and the overlooked” (Mitchell, 2002:170) as they exist within the image and behind/before it, in the technical scaffolding of the visual, that underpins the image and enables its visualization – including the ‘overlooked’ vision of non-humans, and visuality’s precondition of visibility. I did my fieldwork within Imperial College’s Physics Department in London, with members of the Astrophysics Group. My analysis was based on images resulting from this (anthropological) research: images produced by, worked on and kindly shared by my informants; images which were originally part of their (astrophysical) research. I supplemented these with further desk-based research drawing from the rich and publically accessible online data/image galleries provided by various astronomical research centres and universities. In the course of my research and writing up, these images migrated through two very different kinds of visual research methods and epistemic practices. The informal interviews I conducted with individual astrophysicists over the course of two months were structured around “photo-elicitation” (Pink, 2001; Banks, 2001), a method “based on the simple idea of inserting a photograph into a research interview” (Pink, 2001:240). Collier’s idea that it is only through interviews that a photo’s information can be accessed by the researcher (cited in Pink, 2001) was especially true here – where the images are information, and the scientific content was otherwise inaccessible to me. I started interviews by asking the astronomer to introduce and explain their research interests and show me examples of images they had produced. Crucially, in line with the near total digitization of astronomical visualisation, the photo-elicitation was done via computers. After my first informant spontaneously proposed to being her laptop to the interview, it was the screen and not fixed, isolated paper pictures that became the “neutral third party” (Banks, 2001:88) of all the encounters. The digital medium opened up a space for interactivity, with my interviewees drawing from the internet, moving images and ‘non-visual’ data files, and using software to demonstrate the transformation and manipulation of images which changed before my eyes (see Banks, 2001:95). This points towards the richer engagement with images and research potential afforded by a specifically digital photo-elicitation also discussed above by Shireen Walton. Here, it added several layers and a distinct mobility and dynamism to the process of photo-elicitation, which was doubled, through the elicitation of information, and the elicitation of further images. The anthropologist traditionally holds the status and priviledged position of the expert when conducting ethnography, though here, as I crossed the ‘threshold of positivity’ (Foucault, 2002) into the alien territory of the natural sciences, the roles were reversed to the extent that I often felt like a school pupil in a science class. This echoed the nature of fieldwork as a process of child-like socialization and learning, here magnified through the academic context of my fieldsite. Indeed, the astronomers I spoke with are also academics who were no doubt mixing their teaching and public-outreach roles when interacting with me. Our ‘tutorial-interviews’ also had moments that came close to interdisciplinary collaboration, as our mutual embeddedness within the space of the university provided a relationship of familiarity and contextualization. Both my informants and I were conducting research (my research was researching theirs), a fact they often brought up in moments of recognition which probably rendered my presence there, if mildly bewildering and curious, at least somewhat intelligible. This common ground was further expanded by our shared interest in the visual (for very different reasons), which opened up a space for dialogue between my informants and I, quite literally. The interviews I conducted were anchored in a quest for visualization for reasons which go beyond the topic of this analysis: seeing became for me a ‘way in’ to the world of astrophysics, enabling me to grasp some of the incredibly abstract astronomical ideas and processes discussed. My confusion alone could have fuelled these conversations and it made me experience first-hand how intertwined knowledge and visualization really are. Through the interviews, and their computer based demonstrations of images, the astronomers were provoked into what Mitchell calls “showing seeing” (2002:166). Mitchell uses this as a teaching exercise in his Visual Studies classes, asking students “to make seeing show itself, to put it on display” (ibid) and therefore amenable to analysis. In their own discussions and image demonstrations during our interviews, astrophysicists’ “visual culture [was] made to seem strange, exotic, and in need of explanation” (2002: 176) by the presence and questions of a non-astronomer anthropologist. Banks, Marcus (2001): Visual Methods in Social Research. California: SAGE Publications Ltd.
Benjamin, Walter (2005): ‘A Little History of Photography’. In Walter Benjamin: Selected Writings Volume 2 Part 2, 1931-1934, (trans. Rodney Livingstone and Others), (ed.) Michael W. Jennings et. al. Belknap Press. Elkins, James (2007): Visual Practices Across the University, with contributions by thirty-five scholars. Munich: Wilhelm Fink Verlag. Foucault, Michel (2002): The Archaeology of Knowledge. London: Routledge. Galison, Peter (2002): ‘Images scatter into data, data gather into Images’. In Latour, B. and Weibel, P. (ed) Iconoclash: Beyond the Image Wars in Science, Religion and Art. New York: MIT Press. Kessler, Elisabeth (2007): ‘Resolving the Nebulae: The Science and Art of Representing M51’. Studies in History and Philosophy of Science Part A. 38 (2), 477-491. Latour, Bruno (1998): ‘How to be Iconophilic in Art, Science and Religion’. In (eds) Galison, P. L. & Jones, C., Picturing Science, Producing Art. New York; London: Routledge. Latour, Bruno. (1999): Pandora’s Hope: Essays on the Realities of Science Studies. Cambridge, Mass; London: Harvard University Press. Lynch, Michael and Edgerton, Samuel (1988): ‘Aesthetics and Digital Image Processing: Representational Craft in Contemporary Astronomy’. In (ed.) G. Fyfe and J. Law Picturing Power: Visual Depiction and Social Relations. London: Routledge. Pink, Sarah (2001): Doing Visual Ethnography: Images, Media and Representation in Research. London: SAGE. Snow, C.P. (1963): The Two Cultures: And a Second Look. Cambridge: Cambridge University Press. Taussig, Michael (2009): What Color is the Sacred? University of Chicago Press, Chicago. I would like to thank Pauline Destree and Rosalie Allain for their comments on my post, continuing the discussion in relation to their own research projects on photography and digital images. Two main themes came to mind in response: (1) the life span of the digital in Pauline’s discussion, and (2) the categorisation of images and the visual explored in Rosalie’s work. Concerning the life span of the digital, it seems to me that the relationship between the digital and its possible afterlife/lives is not altogether obvious. Certainly one can make interventions towards preserving digital materials, as with online storage systems, or in the case of my research outlined above, the move, or re-materialisation of digital photographs from the ‘dead’ space of an individual’s expired photoblog to the (presently live) exhibition site. In the latter’s case, the digital ‘afterlife’ afforded by the exhibition context and its new publics allows photographs to remain ‘live’, reminiscent of McQuire’s (2013) concept of the ‘operational archive’. These shifts in location and form serve specifically identified needs for preservation, for research purposes, or otherwise. Just as the digital can be used to foster continuity through time and space, it appears that the opposite is also true: that digital objects (such as photographs on Facebook, Flickr and blogs) can also be necessarily ephemeral, of a particular moment, and consciously expunged. But there seems a more complex relationship between ‘life’ and ‘death’ occurring in the digital landscape, as Pauline Destree’s research, on the transnational circulation of funeral and wedding photography in Ghana, importantly reminds. This takes in to account the latent ability of the digital to impact upon the passing of time and on individual and social memory, and is apparent in Richardson and Hessey’s (2009) concept of the ‘dormant archive’. Seen in relation to Facebook, the concept suggests how, through a combination of human and or technological action, we are reminded of dormant or decaying connections (olds posts, past photographs, things we’ve ‘liked’.) These transform the ‘life spans’ or ‘bandwidths’ of social relations and material objects from the past in the present and possibly, the future. In so doing, they attest to the capacity of the digital to expand temporal, spatial and ontological parameters, which is a hallmark of digital-ethnographic enquiry. In response to Pauline’s question ‘what does a digital “invisibility” look like?’ there seems a range of possible answers. We might visually think of it as a kind of barren wasteland; a graveyard of expired blogs and decaying content akin to the visual imagery conjured by Salena Godden’s poem ‘The back of the Internet’. We might also conceptualise ‘invisibility’ as the negative spaces between human endeavours taken up and abandoned online, which may or may not/be able to make the cut to pseudo-‘immortality’. Ultimately, it seems that digital afterlives (their existence or deliberate creation for research purposes), like digital lifeworlds, are contingent upon the interplay between human actors and technologies, motivations and interventions. Replying to Pauline’s question ‘could we envisage the possibility of a digital afterlife?’ we might invoke aspects of established debates in anthropology and museum studies, such as Clifford’s (1989) ‘beyond the salvage paradigm.’ This would encourage continued critical reflexivity in the digital landscape in asking, quite simply: why might we or other actors want to preserve something and stop it from expiring? More specifically, what resources might we/they have to do so? Thinking through the associated politics and practices of these questions puts ancient relics, cultural objects, dead photoblogs and even deceased persons (provisions taken by Facebook to memorialise users’ accounts after physical death) on an ethico-historical plane which should anchor all critical thinking about digital afterlives, from the museum to the web. In discussing her research project on astronomical visual practices, Rosalie Allain offers a stimulating testament to the need to think critically about the different contexts in which digital images are generated and studied, as well as how they might foster space for inter-disciplinary dialogue. The digital can certainly encourage us to re-consider boundaries, particularly regarding the relationship between form and content in our processes of categorisation. In my own project on Iranian photoblogs, I explore what Rosalie refers to as the ‘democratic and inclusive conceptualisation of the visual’, in asking (how) are photoblogs art? Perhaps though, the question of how we classify participants’ and their cultural objects in the digital sphere is less of a new concern, than a sober reminder of the need to attend to emic and etic orientations and projections in our study of others and their images. Rosalie’s discussion importantly highlights the fact that new digital contexts call for established, as well as field-specific questions and methodologies. Her look to the natural sciences and other types of images often overlooked by social scientists (see also Shim’s (2013) work on satellite images and the cultural (geo)politics of seeing), marks a refreshing step towards broadening the horizons of digital-visual ethnography, including how anthropologists today conceptualise their field sites. Clifford, J (1989). Beyond the ‘salvage’ paradigm. Third Text, 3(6): 73-78. McQuire, S (2013). Photography’s Afterlife: Documentary images and the Operational Archive. Journal of Material Culture, 18(3): 223 – 241. Richardson, K and Hessey, S (2009). Archiving the Self? Facebook as Biography of Social and Relational Memory. Journal of Information, Communication and Ethics in Society, 7(1): 25-38. Shim, D (2013). Visual Politics and North Korea: Seeing is Believing. London and New York: Routledge.